Although it occurred a decade earlier, eventually the Foshan feat became a legend among the Hong Kong students of relocated Wing Chun grandmaster Ip Man (Donnie Yen). However, as those who witnessed Ip Man voluntarily battle ten men at once in director Wilson Yip's masterful semi-biographical prequel can attest, when it comes to martial arts, actions always speak louder than words. And fittingly, the jaw-dropping stylized action from the Ip Man series' fight choreographer and supporting player Sammo Hung is ramped up to near Jackie Chan levels in Yip's follow-up to the original, internationally embraced picture. Sure enough, the Chan technique that grew out of the physical daring of silent comedians like Buster Keaton and Charlie Chaplin foreshadows that every prop will be used at the disposal of the actors in some truly inventive stunt-work that pays off superbly in Ip Man 2's most talked about scene, which finds Yen and Hung battling one another atop a wobbly, slippery table in a room full of unbalanced upside down stools. However, unlike Chan's frenetic pace and penchant for gags that provide a quick giggle in his Hollywood crossover movies, there's a real artistry at work here that can't be understated. 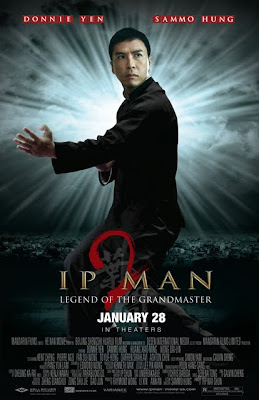 While not quite committing fully to the poetry in motion style of high kicking fliers in Crouching Tiger or Hero, Yip's Ip Man 2 nonetheless offers a happy medium in the palatable lesson of good vs. evil through a David and Goliath style framework that translates well in any language and across every border. 2 checks back in with Ip Man roughly a decade after leaving Foshan for Hong Kong due to the horrors encountered in the Second Sino-Japanese war as he endeavors to create a school in his new homeland. Along the way, Ip Man forms unlikely alliances with former antagonists with whom he bands together to take on a bigger evil. And as stated earlier, since this time around the emphasis is on the action both in staggering fights and impressive training sequences that should appeal to Karate Kid and Rocky devotees, it's safe to say that producer Raymond Wong may be looking at an even greater commercial success than the first movie achieved in the United States. Although it's always valid to raise concerns about countries that exploit one another for all they're worth with little respect for their people, history or basic morality, doing so in a one-dimensional propagandist way threatens just how seriously others will take the final half of the film. 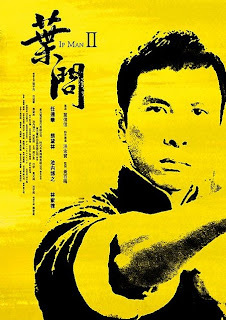 Abruptly abandoning Ip Man's struggles to fit in as a martial arts master and provide for his family when he's sabotaged by other teachers, the movie takes a break from biography in order to do some flag waving via bone breaking with a narrative shift emphasizing patriotism. 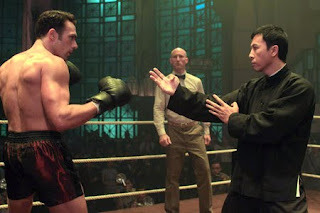 And because the first film also served up some stereotypical villains, predictably Ip Man 2 culminates in an East vs. West battle wherein our hero uses Wing Chun to teach the bullies a thing or two about ethnic prejudice. However, even though I preferred the overall epic character arc of its predecessor, it's extremely easy to dismiss the well-intentioned missteps of Yip's otherwise high-quality sequel by relishing in the seductively rich earth tones of the cinematography and Hung's extraordinary choreography that leaves you gasping for air.